Jesus Christ walked this earth for about 33 years. Of them, only the last 909 days (two and a half years) were spent in public ministry. After his death and resurrection, his words, deeds, and actions were recorded in four different gospels for all to read. But many Christians, and maybe you, read one gospel at a time and don’t quite understand how the four fit together. Regular church attendees may get to the point where they unconsciously tune out parts of the readings because they “know how this one ends.” They hear the same bits and pieces about the life of Jesus Christ, but don’t know the full chronological context in which these events take place. This book changes all that. Immerse yourself into the 909 days that changed the world. Read "Local author's book achieves the 'wow factor'" from the Catholic Star Herald, posted March 26, 2015. 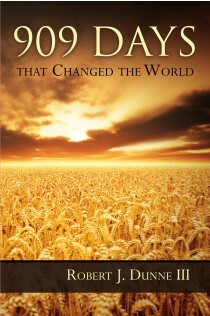 Read "'909 Days' offers perspective on Jesus' public ministry" from The Monitor, Trenton, NJ, posted March 15, 2015. Bishop David M. O'Connell talks about 909 Days on the show The Shepherd's Voice, December 2014. Listen to author Bob Dunne's interview on Friday Live with hosts Jim Manfredonia and Gabriella Furmato, January 30, 2015. Watch Bob Dunne on the "Catholic Corner" with Msgr. Walter Nolan, March 23, 2015. Listen to author Bob Dunne's radio interview on "Personally Speaking" with Msgr. Jim Lisante, April 2016. Robert J. Dunne III, grew up in Bergen County, NJ. He went to Columbia University in NY for his B.A. degree and the University of Chicago for his M.B.A. degree. This is the first book written by Robert J. Dunne III. It is the fruit of many years of personal prayer, study, and reflection.